And the same flower that smiles today Tomorrow will be dying. It would be blasphemous to start this article on any other note than Professor John Keating himself ordained. For those of us who have watched Dead Poets’ Society, Keating is no less than a miracle that happened to his students – both onscreen and off screen. In his very first lesson, Keating instructs his students to rip out the introductory page of the poetry book, making it clear to the boys that poetry is supposed to be read, cherished, and most importantly, felt. It is not something that men of old have interpreted for us and we have to accept it. He let’s his pupils call him “O Captain, My Captain” after the immensely famous poem by Walt Whitman, which we all think exceeds all limits of cool. Being a teacher of literature, the best and the most important thing that he does is letting his students know that words mean the world. He believes in the power of speech, of poetry, of literature and passes on the same belief to his students. He understands the importance of your individual opinion – that that is what sets you apart. He tells his students to think for themselves, and voice out whatever they feel. He knows the very purpose of language. And, might we say, he is not entirely wrong! While education has become nothing more than passing tests and mugging up, he seems to know the real purpose of education. He told us about the power of dreams, and made us believe how meaningless life would be without them. When he taught us that uniqueness is a trait that we should never give up on. The sheer pleasure of being odd, being ahead of our time. Keating taught us, that yes, we can have our own opinion of why the curtains are blue! There is a time for daring, and there is a time for caution. What better way to say this than how Keating does? The world is forever evolving, forever reforming. This is how Keating keeps up-to-date. We cannot articulate how fundamental a yawp is! And our Professor taught us a thing or two out of syllabus, the yawp being one of them. Uncle Whit makes an appearance several times in the movie, and his words are made alive by our dear teacher of English. Carpe Diem, seize the day, is what this artist tells us in a world which is so bent on following rules. And, finally, when he supports us liberal-arts students, and tells the world what it is alive for! 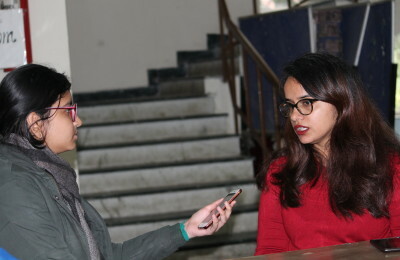 Previous PostTurning a Blind Eye Towards Maternal Mortality Next PostJesus and Mary College, Delhi University, organized its first edition of an independently organized TED event, TEDxJMC!